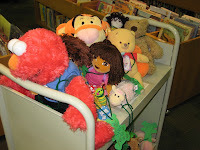 On Friday at 4:00 we had a storytime and invited kids to bring their stuffed animal for a sleepover at the library. 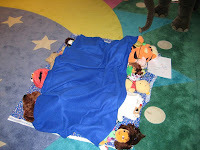 We read books about toys and bedtime, then the kids made name tags for their toys (just to ensure that no one's got mixed up), and then they tucked them in for the night. 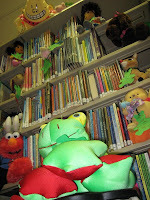 Once everyone was gone, we librarians got out the stuffed animals and took photos of them "playing" around the library. On Saturday, the kids came to pick up their toy. We printed out one picture for each child to take home and showed them all the other pictures. I wasn't there for the pickup, but from what I hear the photos were a big hit and we got some great feedback. This was a fun, inexpensive program that I will definitely do again in the future. I don't think we even really needed to print out a picture for them. Most kids seemed to be thrilled with looking at the pictures on the computer and I emailed the pictures to any interested families. I'm glad you picked the one of Nellie reading to them, cuz it's my favorite! I came across this post while googling my name. I'm Della Ross Ferreri, the author of How Will I Ever Sleep in This Bed? and I was delighted you read my book during the stuffed animal sleepover. You brought a smile to my face! You may be interested in knowing, I have another picture book coming out summer/fall 2009 entitled STAR OF THE SHOW. It's a fun story of a bossy big sister and a tag-along brother trying to put on a circus. I hope you and your young readers will enjoy this humorous look at sibling rivalry, competition, and of course, compromise. The publisher is Shenanigan Books founded by the talented Mary Watson. Again, I'm happy you're enjoying my book. It's certainly a thrill for an author to come across such a fun library program!